The organization I was happiest to meet was the Saylor Foundation — I have been a fan of theirs since discovering them last year; their work addresses the heart of a core problem in the world of educational resources: a free comprehensive collection of texts drawn from all manner of sources — whatever is useful and to hand. Aside from the typical modern-charity peccadillo of feeling organizational ownership of what is a universal mission, and articulating a vision in which they accomplish it through sweat and brand, I find their approach humble and excellent. My favorite invitee was CoolCatTeacher Vicki Davis, who shared some pointed advice and wit, contributed in most of the sessions I attended, and shared my penchant for live transcription. (We commiserated about how funny it was to be at an event highlighting collaborative creation, where most attendees had computers but were shy of using etherpads or shared docs.) She was not a grantee; Berkman, in their take on this rotating annual event, invited about a quarter of the total guests from a variety of backgrounds, for pursuing in their own way more universal access to education. Her prolific writing and multitasking online, has inspired me to spend much more time writing. But more on that in a future post. I also met the pedagogy lead for Intel’s global education program – a teacher full of good ideas and strong support for making OER the norm in primary school – and part of the Metalab team working on narrative tools. I spoke to the grantees about the needs of content Builders, along with Hal Abelson and Ahrash Bissell, and took part in a variety of brainstorming sessions. My favorite moment was a debate about whether free knowledge and educational resources are (as I maintain) civic infrastructure, worth investment by cities and locales the way roads and libraries and wiring are. An unresolved question there: how a local government would identify what part of that global problem is theirs to locally provide or fund. On Friday I helped plan and run a Hack Day after the traditional meeting ended, something new for this sort of gathering. It was great fun, and refreshing after a few days of simply talking to move one or two ideas closer to realization. I wish most of every conference were like this, since we still managed to get in our share of discussion, presentation, show & tell, and otherwise sharing inspiration. Thanks to the Berkman team for their creativity in the organization, and to the organizers for inviting me to take part. Open education is an idea ready for global adoption, and one we should pursue mindfully, in norm and nuance, as a society. Brows the syllabus and photos from the amazing course Human-Computer Interaction +Rapid Prototyping +Learning Sciences + Constructionism + Critical Pedagogy which is given by Paulo Blikstein at Stanford’s beyond bits and atoms group. Does that sound like something you’d be interested in doing in a town near you? It something in between the Media Lab’s lifelong kindergarden group, fablabs, and an peruvian olpc robotics lab, for grad students. 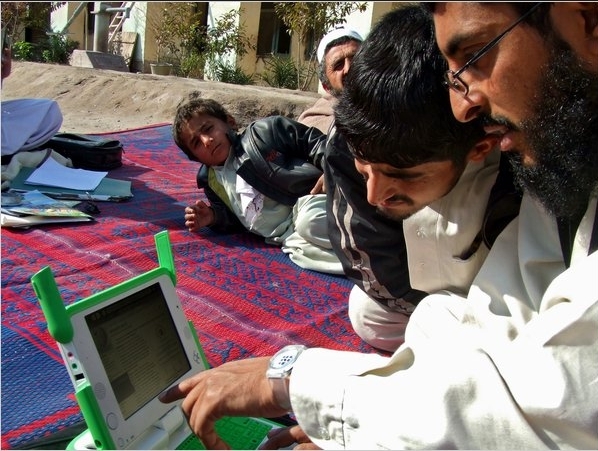 OLPC Afghanistan currently works with school in Kabul, Jalalabad, Herat, and Kandahar. This is one of our most politically complex and interesting deployments. The initial schools involved tend to be on the wealthy side, but are still often in areas with poor power and connectivity. Over a year after that deployment finished, I am working with FabLab folk to figure out what a similar lab and community wifi setup might look like in Herat, where we also have an OLPC school and may add another. They’re refreshingly fun and competent people to work with, and full of great stories about young Afghans taking interesting ideas and running with them, turning them into amazing art projects or montages or startups. Any city trying out cool new technical innovations should have a fablab to amplify the joys of being on the cutting edge. Today we have 4,000 families connected to eachother and to the Internet in Afghanistan through OLPC; we hope to have thousands more by the end of the year. And now I’m wondering if we can get fablabs started in the US cities where there are significant OLPC projects. Drumbeat is a new Mozilla umbrella project, consolidating its efforts to support and enhance the open web — the free and transparent elements of the Web that we love and rely on. It combines earlier work on One Web Day, educational outreach, and direct grants to developers improving the free tools needed to expand the web. 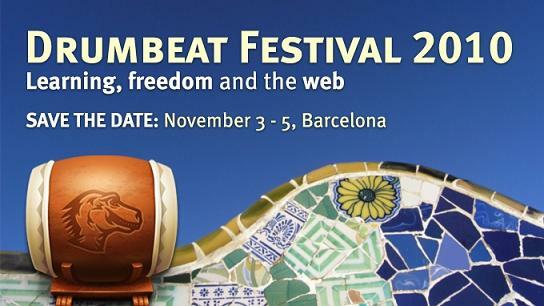 The first global Drumbeat Festival will be held in Barcelona on November 3-5, and creators everywhere are invited. I have been part of local Drumbeat events in New England this summer (run by Ben and Dharmishta), where the pervasive interest in learning was wonderful and fascinating. I can’t wait to see a larger festival come together. This year’s theme is Learning, Freedom and the Web. The open nature of the internet is revolutionizing how we learn, and Drumbeat welcomes teachers, learners and technologists from around the world who are at the heart of this revolution. Join us in Barcelona for three days of making, teaching, hacking, inventing and shaping the future of education and the web. A Festival! Should I bring my best hat? Hat, HUD, musical instrument… Drumbeat is not your typical conference festival. Imagine a folk festival combined with a teach-in with a dash of outstanding oratory for good measure. That’s the plan. You’ll have a chance to propose and invent activities throughout the festival. You can read a small sample of planned activities to get your creative essences flowing. Registration opens on August 25. You will also be able to apply for a travel scholarship, propose activities, or offer to volunteer. If you are not already on our email list, you can sign up now. Reminders will be sent out when registration opens. Meanwhile, please spread the word – encourage your friends and colleagues to sign up for announcements, start discussing what you’d like to invent or create while there and what you might show off! Mitchell Charity recently quoted to me from Lant Pritchett‘s essay, “Long-Term Global Challenges in education: Are There Feasible Steps Today?” – Ch.3 of RAND’s Shaping Tomorrow Today: Near-Term Steps Towards Long-Term Goals. I wonder how RAND chooses the areas it tackles for long-term global planning. How does one go about finding ‘documents like this’ (e.g., long-term plans for educational purpose) in a meaningful way? Tony Pryor, call your office.